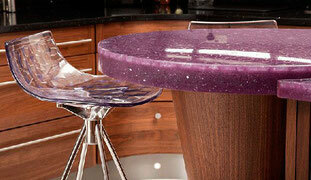 Most of our customers purchase well-known styles of worktops such as wood, Corian and Quartz. However, for some of us nothing but completely unique will do! Using our network of contacts within the industry and local artisan community, Brighton and Hove Kitchens will work with you to achieve the look you want - whether it is a "live edge" piece of timber or recycled glass such as this example from UrbnRok. When considering a bespoke worktop, it is important to consider factors such as durability and practicality as well as appearance. Because of the nature of bespoke worktops it is not always possible to see an example before you commission your worktop. Brighton and Hove Kitchens can assist you in choosing a bespoke worktop and we will use our expertise and experience to advise you on the best option for you.